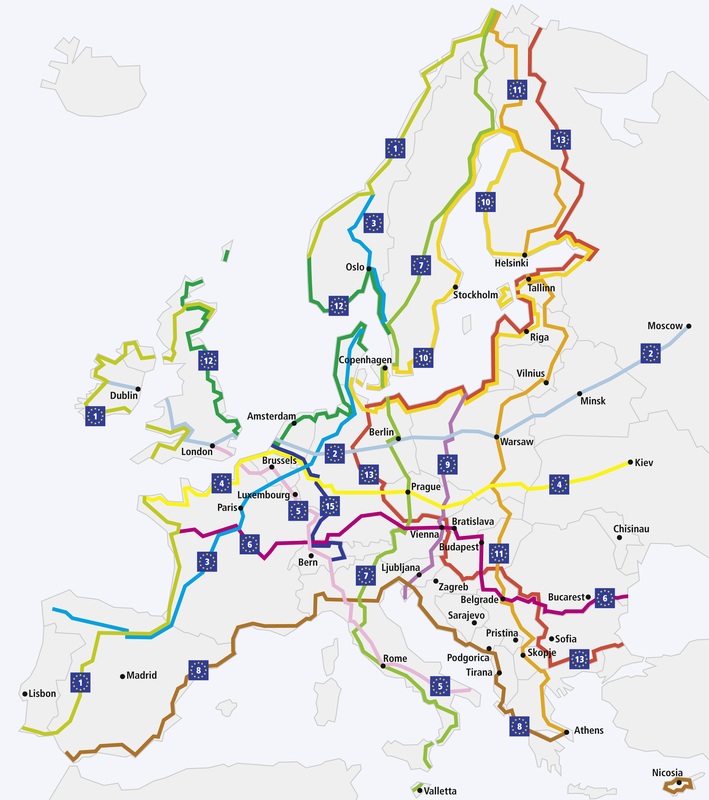 I read a post last week on the European Cyclists Federation website that said that the European Parliament’s Transport (TRAN) Committee are voting on wether to include the EuroVelo Network in the Trans-European Transport Network, which essentially would mean a bunch of money is provided to fund its completion. The figures are quite interesting and indicate that € 1.5 – 2 billion will need to be spent to gain €5 billion in ANNUAL economic benefits! In my book, that’s a no-brainer – spend some, gain lots. I am officially putting my hand up as a proto-tourist that is ‘champing at the bit’ to give my hard earned cash to any gorgeous businesses sited along well constructed cycle paths – I’ve even started creating a budget for what we intend to exchange for goods and services in each country. At this point, I do have to share some shocking news … SPAIN WILL NEED TO BE STRUCK OFF! I have found out that they have one of those damn silly helmet laws, and the very last thing I intend to do in my gap year is go anywhere near a country plagued with such a blight. The law is interesting as it seems to be even less enforceable than the standard kind that we, and our cousins in Australia, suffer under. It appears to only come into effect in rural areas and does not apply to cyclists riding in towns and cities; during periods of extreme heat; when riding up steep hills; or to professional cyclists. I am interested in how they manage and police this. Is there a sign along the road as you travel out of town that informs you that helmets must be worn from this point onwards? I’m also wondering what it takes to be termed ‘professional’ … is it the outfit or must someone pay you to ride? If someone paid me, say $2, to ride around Spain, would that make me a professional cyclist? By all accounts, it seems that they don’t actually bother to enforce it too much as quite obviously, they have better things to do with their time. But on principle, apart from a quick train trip across the boarder to and from Barcelona, I think Spain must be struck off our list. Sorry, but no cycle tourist Euros will be leaving our wallets to find new homes with local Spanish businesses. If anyone has any further information on this law, please let me know. Cycle route planning has become a little more organised and we now have an official ‘HQ’ for the trip. 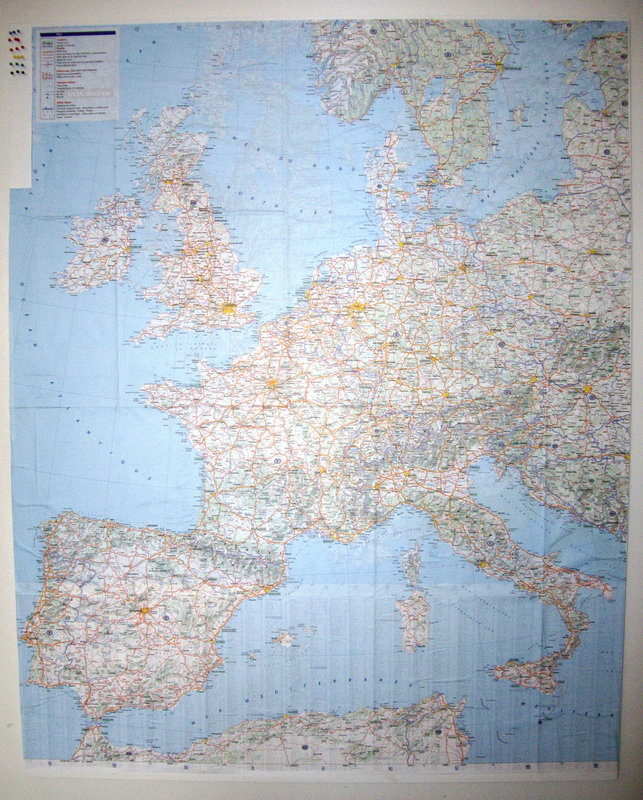 We have a map of Europe on the wall in the study and have armed ourselves with map pins and coloured thread. It was actually the Husband that came up with this plan to map the general route in this way, with different coloured wool for train and bicycle journeys. This is a clear sign from the travel gods … of what, I’m not sure … but this behaviour is sooo out of character. ‘Mr Organised’ he most definitely is not; ‘organisation’ and ‘planning’ is usually viewed as the devils work. Above: the naked map … oooh the possibilities! I also did my first Google search on ‘train travel in Europe’ and I am already very confused by the number of ticket options available. It appears that if you are resident outside Europe, are under 50 with a birthday before June in each consecutive year, can name the capital cities of all EU nations and are traveling without a yak, you are entitled to a first class ticket at a discount price of €303.45 valid for use on 6 days out of 5, on alternate weeks, provided you board wearing lederhosen … or something like that! I think that figuring out the train travel may require an Excel spreadsheet at least and potentially a PhD in European rail transit. The bicycle travel seems a lot more simple to figure out. You can cycle between A and B … if you have a bicycle. Ah I love maps. Can thoroughly recomment Man in Seat 61 website for your train element of the trip. Has great information and advice, if possible book some train legs in advance. We got a $20 ticket for London to Liverpool which is usually approx $80 and on the day would have been $200! The Spanish did do some excellent research into the effects of the helmet law in urban areas and concluded that they should abolish it immediately. If you happen to change your mind about visiting Spain, you might like to see if you can meet the people involved. @Lisa – actually, you have a point. It might be a really good opportunity to find out more about it. We will probably go to a couple of the big cities anyway as I think we will go through Spain to Portugal. Previous Post Sale at Bivouac!